I recently had a chance to log some miles behind the wheel of the 2014 Toyota Tundra and there weren’t just any miles – they were miles driven in some of the most scenic roads in the United States as we traveled around the Smokey Mountains. While the 40 miles that I drove on road and off weren’t enough for me to draw enough experience on which to base a full review, this seat time gave me a good look at where Toyota is headed with the new Tundra. When I attend most new vehicle unveilings, we listen to a presentation about how the vehicle in question is better than the competitors at this, that and the other thing but Toyota took a different approach in introducing us to the 2014 Tundra. Don’t get me wrong – there were some simple comparisons of how the fuel economy figures and power numbers of the 2014 Tundra compare to the half ton entries from Ford, General Motors and the Chrysler Ram brand but in designing this new Tundra, the company looked to what their customers wanted more than looking at what the competition was offering. This included a more upscale interior and an exterior design that is more aggressive and less “bubbly”. The subject of my drive around Tennessee was a 20104 Toyota Tundra Limited with the CrewMax cab, four wheel drive and the 5.7L iForce V8. Due to the extreme conditions of the drive including some unpaved mountainous roads and some very slow going driving on single lane road traffic, we were not able to acquire any sort of fuel economy figures but these steep roads and questionable footing helped to display the power of the 5.7L V8. Toyota hasn’t added any power to the 2014 Tundra but with 381 horsepower and 401lb-ft of torque – the 2014 Tundra feels strong in all of the conditions that we experienced. Whether we were climbing a steep mountain road or blasting away from a stop light on a paved road, the new Tundra packs more than enough power to get this big truck moving in a hurry. One unseen area where the 2014 Toyota Tundra has been improved is in the ride quality via new suspension and chassis tuning. Our time spent cutting through the treacherous mountain roads where the surfaces were all mud, rocks and deep ruts helped to display just how well these handling efforts have been received. Even when we were headed downhill on steep, rocky roads slick with mud and riddled with deep potholes, the Tundra handled itself very well. 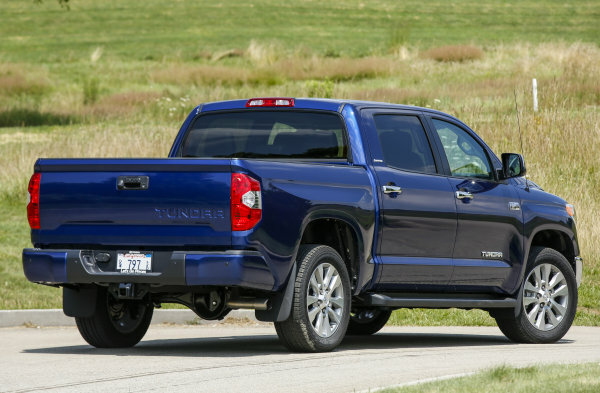 The new Tundra was also clearly more stable when moving at a quicker pace along the long straight stretches of the offroad portion of the drive. On road, the suspension changes weren’t as noticeable but with the roads that we were on being so smooth – they didn’t offer much chance to experience anything but the lower level of sound inside and the straight line acceleration on nice smooth surfaces. While the road handling ability of the 2014 Toyota Tundra will surely help keep those folks who buy a new Tundra happy, the interior and exterior design is what first pulls in a consumer and those are two areas in which the Tundra has changed quite a bit – with successful results. Consumers complained that the previous Tundra was too bubbly so with the 2014 models, Toyota added a bigger bold grille that sits on a taller front end with a TON of chrome from top to bottom and side to side. The headlights are bigger and squared off more than the 2013 models and while the grille has maintained the basic shape from the previous generation, there is no denying that the new models have a distinctly more aggressive face. Key features of this new front end (aside from that massive chrome grille) is the air intake mounted where the grille meets the hood – a hood which is much more angular, furthering the shift from sleek and bubbly to big and bold. Along the sides, the 2014 Tundra wears wheel arches that incorporate the majority of the front fenders and the rear bedsides with sharpened body lines connecting the front and rear openings. Finally, the back end features an integrated tailgate spoiler and the Tundra name proudly stamped into the face of the tailgate. 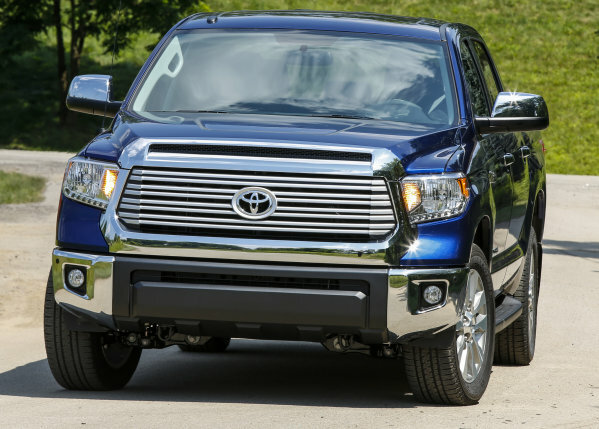 As an interesting note, one other new feature of the 2014 Toyota Tundra features three piece front and rear bumpers. Toyota found that trucking activities frequently tear up the outer corners of the bumpers and that causes people to replace the entire bumper to address those damages. 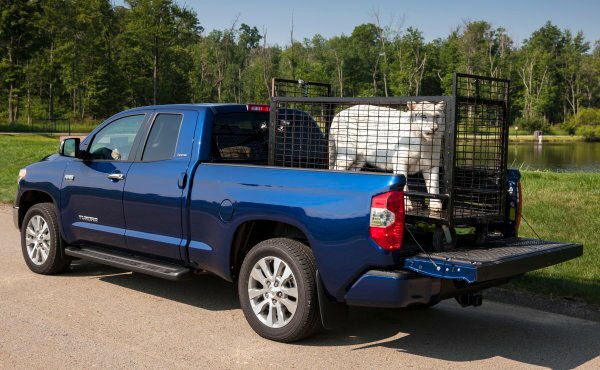 However, the modular front and rear bumper of the 2014 Tundra allows owners to replace the damaged component rather than buying a whole new bumper after getting “too close” to a tree while rumbling through the woods. The interior design of the 2014 Toyota Tundra has also taken a bigger, bolder design that follows the trends set by the exterior. Running across the dash, through the middle of the dash and along the door panels are hard lines and this linear design gives the cabin a very wide feel inside while all of the leather, wood trim and silver accents of the Tundra Limited package achieve the goal of being more upscale than the outgoing models. The Tundra has steering wheel controls and big knobs that are designed to be easy to use with work gloves on whether you are trying to turn the radio up, adjust the climate control or engage the 4WD system. The new Entune system looks and works great but as has been the case with some other Toyota models Ive reviewed lately – I find myself wishing for a hard button to bring up the navigation system rather than having to flip through the touchscreen infotainment system menu. Finally, the huge CrewMax cabin of my 2014 Toyota Tundra Limited test truck puts the Max in CrewMax with tons of space for the driver, front passenger and rear passengers. This big roomy cabin looks great and provides plenty of leg, elbow and head room for even the tallest driver and passengers while the new upward folding rear seats allow for easier access to a larger cargo area. The American truck segment is one that is dominated by loyalty and because of that, the changes made to the 2014 Toyota Tundra probably aren’t going to be enough to sway any longtime Ford, Chevy or Ram trucks owners to swap to the Tundra. Toyota is at a disadvantage in power to all of the Big 3 half ton pickups so serious truck users might be more likely to look at the domestic pickups but as Ford Motor Company likes to point out – many truck owners don’t really buy trucks based on what they can do. Polled consumers wanted a more upscale interior and an exterior design that is less bubbly – and that is what Toyota has delivered with the 2014 Tundra. The exterior still bears a distinct resemblance to the previous generation Tundra but the styling has been sharpened to give the 2014 model a bigger, bolder look which is a similar direction to that of the bestselling trucks in the US market. 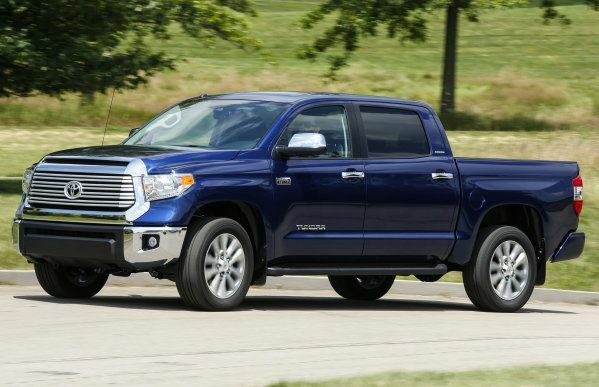 Most importantly…the exterior design is not one that you can call “bubbly” so those prospective buyers who have gone away from the Tundra because they didn’t like the rounded styling may be more likely to accept the 2014 Tundra. In the long run, all of the trucks in the half ton segment (except for the Nissan Titan) have gone to a bigger, bolder look that had previously been reserved for the heavy duty segment and while Toyota didn’t chase numbers in the battle with the Big 3 pickups – the big, bold look gives the 2014 Tundra more personality than the outgoing models with an interior that is spacious and much tighter in terms of fit and finish.